Today it's wet, windy and chilly, so I decided that it was an excellent day to share this bright and cheery recipe with you. This is my son's birthday cake from this spring. I love how he always chooses fruity cakes. My personal favorites, whereas my daughters tend to lean towards chocolate, which is not my favorite at all. The last several years he has been very adamant about strawberry cakes for his birthday, but this year he decided he wanted raspberry instead. I was happy to oblige. I am not sure if my birthday cake had some part in his decision process, but I was happy to go with it. Last year, when I made one of his two cakes, I made ice cream for one of the layers. It was a big hit, so I decided to do it again. 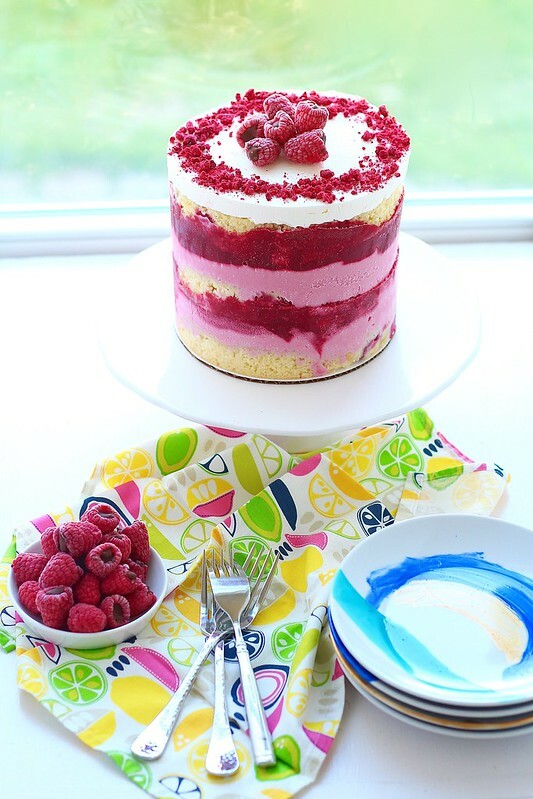 Since raspberry is such a delicate flavor, I decided to make the fillings purely raspberry. 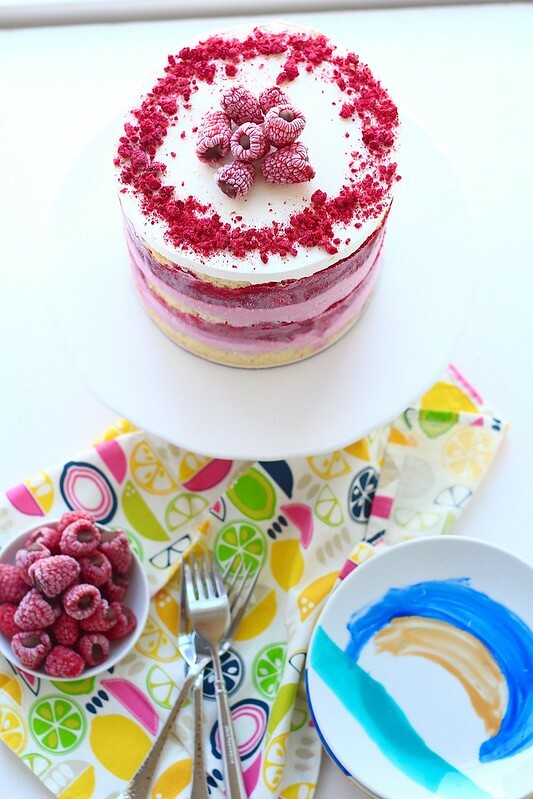 The raspberry sauce and ice cream are sandwiched between a simple yellow cake that is dotted with fresh raspberries. Like my birthday cake, I decided to top the cake with freshly whipped cream again. 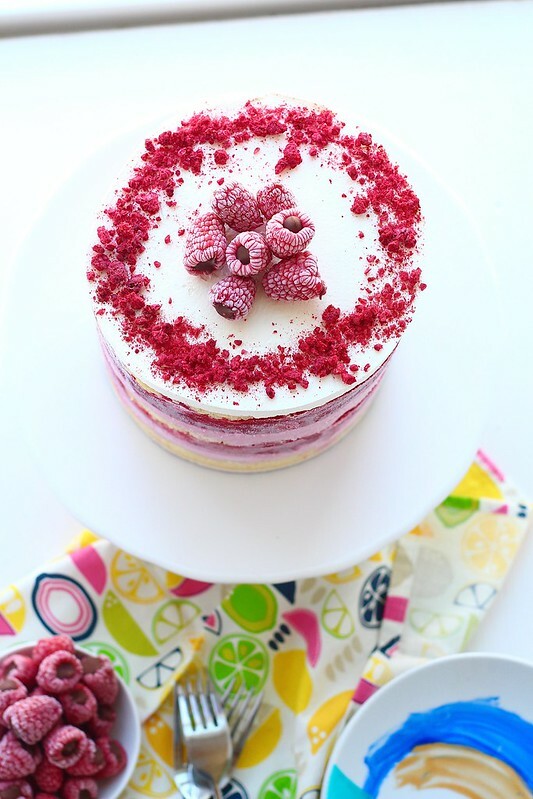 It lightens up the cake, whereas frosting I think would make it heavy and smother the raspberry flavor. This cake, unlike some of the other ones I have made, is pretty straight forward. Yes, you do need to plan ahead and make a few of the items before hand (i.e the ice cream), but otherwise, the cake comes together fairly easy. This is an excellent cake for the middle of summer. You store the cake in the freezer, which makes for a quick, cool slice on those scorching days. If you are hosting a BBQ, this makes a great dessert you can make a few days in advance and it will serve quite a few people, despite its' size. A small slice goes a long way with these cute little cakes. Hello summer and fresh, in-season fruit! To make the ice cream, blend the raspberries with the honey until smooth in a blender or food processor. Push the purée through a fine mesh sieve to remove seeds. Set aside. Whisk together the cornstarch and 2 tablespoons of the milk in a small bowl to create a slurry In a large bowl, mix the cream cheese and salt together until smooth. In a medium saucepan, combine the remaining milk, heavy cream, sugar and corn syrup. Bring to a rolling boil over medium-high heat, stirring occasionally. Let boil for 4 minutes, stirring occasionally. Remove from the heat and whisk in the cornstarch mixture. Place the saucepan back over the heat and bring to a boil again over medium-high heat. Stir constantly with a heatproof spatula until slightly thickened, about 1 minute, then remove from the heat. Whisk the hot milk mixture into the cream cheese mixture until completely smooth, then whisk in the raspberry purée. Cover and place in the refrigerator until completely cool, several hours or overnight. Don't churn the ice cream until you are ready to assemble the cake. To make the sauce, combine raspberries, and sugar in a non-reactive saucepan over medium-high heat. Cook, stirring occasionally, until the berries begin to soften and release their juices. In a small bowl combine the cornstarch with the water and lemon juice and whisk until smooth. Stir the cornstarch mixture into the raspberry mixture. Bring to a boil, then reduce the heat to a simmer and cook for 1 minute more. Remove from the heat. Cover and refrigerate until completely chilled. To make the chocolate filled raspberries, place the fresh raspberries into a mini-muffin tin (makes filling much easier). Place the chocolate chips and coconut oil in microwave safe bowl and heat until melted, about 1 1/2 to 2 minutes. Either spoon the chocolate into the raspberries, or place in a small ziplock bag and snip off the corner to create a simple pastry bag. Fill each raspberry cavity to the top. Place the muffin tin with the filled raspberries in the freezer and let set until the chocolate has completely hardened, several hours. Remove the frozen raspberries from the tin and place in an airtight container. Freeze until ready to use. These will store up to several months in the freezer. To make the cake, heat the oven to 350ºF. Butter and flour the edges of a quarter sheet pan. Line the bottom of the pan with parchment paper. In the bowl of an electric mixer fitted with the paddle attachment, combine the butter and sugars. Beat on medium-high speed for 2-3 minutes, until fluffy. Scrape down the sides of the bowl, add the eggs, and mix on medium-high for 2-3 minutes more. Scrape down the sides of the bowl again. With the mixer on low speed, stream in the buttermilk, oil and vanilla. Increase the speed to medium-high and mix for 4-6 minutes, until the mixture is nearly white and twice the size of the original batter, and completely combined. Scrape down the sides of the bowl. With the mixer on very low speed, add in the cake flour, baking powder, and salt. Mix for 45-60 seconds, just until the batter comes together. Sprinkle the raspberries over the batter and gently fold in with a rubber spatula. Spread the batter evenly in the prepared quarter sheet pan. Place in the preheated oven and bake for 30-35 minutes, rotating the pan once halfway through baking, until the cake is puffed and the center is no longer jiggly (the cake should bounce back when lightly poked with your finger.) Transfer to a wire cooling rack and let cool completely. When you are ready to assemble the cake, churn the ice cream. To assemble the cake*, invert the cake from the sheet pan onto a work surface. Use a 6-inch cake ring to cut out 2 circles from the cake (these will be the top two layers.) Wipe off the cake ring and place it in the center of a sheet pan lined with parchment paper or silpat. Use a strip of acetate to line the inside of the cake ring. Use scraps from the leftover cake to place in the ring and press together in a flat, even layer. 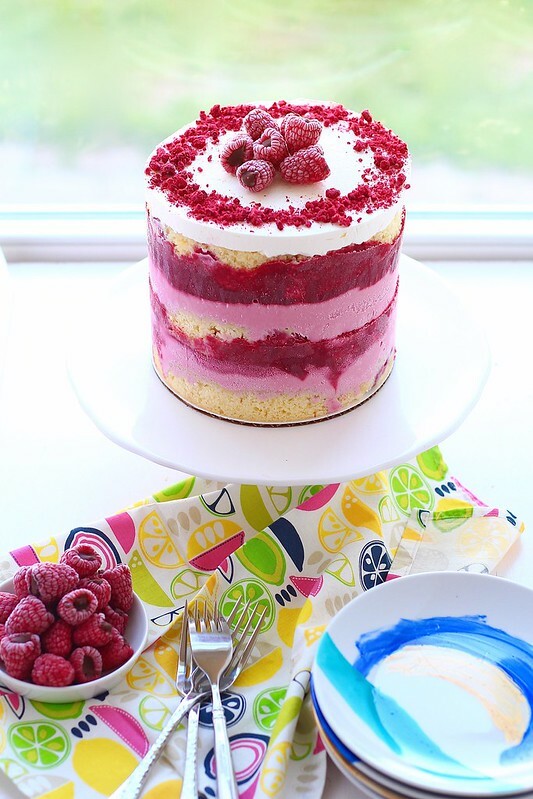 Spread about 1/2-3/4 cup of the raspberry ice cream over the cake in an even layer. Spread half of the raspberry sauce over the ice cream in an even layer. Gently tuck a second strip of acetate between the cake ring and the top 1/4-inch of the first strip of acetate. Set a cake round on top of the raspberry sauce, and repeat the layering process once more of the ice cream and remaining raspberry sauce. 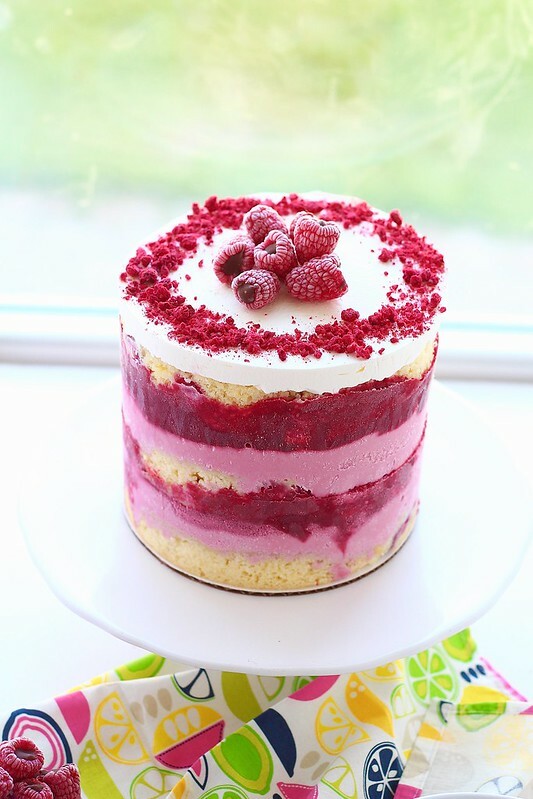 Place the remaining cake layer onto top of the raspberry sauce. To finish, make the whipped cream. Pour the heavy cream, confectioners' sugar and vanilla extract into a small bowl. Us an electric mixer and whip the cream until stiff peaks form. Spread the whipped cream over the top cake layer. Transfer the assembled cake to the freezer and let chill and set overnight. At least 3 hours before you are ready to serve, remove the pan from the freezer, pop the cake out of the cake ring, and peel away the acetate layers. Transfer to a cake platter and place back in the freezer. When ready to serve, sprinkle the freeze dried raspberries over the top and pile with chocolate filled raspberries. Slice and serve immediately. Store any leftovers covered in the freezer for several weeks. *If you would like a visual on how to assemble the cake, check out this post here.